How much time shall I spend on Social Media? Chanel and her team are the best! If you need work done related to Social Media, try Chanel-you will not be disappointed! Chanel has assisted us with our Social Media for YouTube, Facebook, Twitter and Linkedin. She is very creative and has an in depth knowledge of Social Media and Marketing. She assists businesses whether small or large and is very flexible as to their requirements and budget. I can highly recommend using her services to all Business owners! Chanel is an extremely honest and highly ethical person. She has a great work ethic and is a pleasure to work with. I would unreservedly recommend Chanel. Due to the fact that we have clients in many different time zones, we sometimes work long days that are a combination of early hours and late nights. Chanel is always available to assist our clients and dedicates herself to completing every aspect of a project she is assigned. Chanel is professional and proficient; the quality of her work is of the highest standard for the Inspire and Acquire clients. Chanel assists me in various aspects of running the Inspire and Acquire business and I rely on her to take on more of my workload as our business grows. She does this with the utmost competence. The Inspire and Acquire clients benefit enormously because of Chanel's efforts. Chanel has an in depth knowledge of Branding and can assist you in getting the online presence on the internet that your Business needs in order to boost their sales and client base. She is a good SEO consultant and an expert when it comes to Marketing. I can highly recommend using Chanel as a consultant for your business. Chanel has assisted me with my social media and I have found her very professional and with an excellent knowledge on the topic. I know she will be of great value to assist with brand development, search engine optimisation as well as engaging the target market for all businesses. I can highly recommend hiring her team for her services! Chanel is a highly professional business woman with an up to date knowledge of the latest SEO and Social Media developments. She always exceeds the expectations of her clients and I can recommend hiring her for all your marketing needs. Chanel is working in the capacity of a high tech social network expert to integrate all of our non-profit's information into three websites for increased awareness. She is doing an outstanding job and we are pleased with our results. We will continue to use her as a marketing consultant. Chanel has a mission and a vision that use her professional skills and creativity to help humanity. 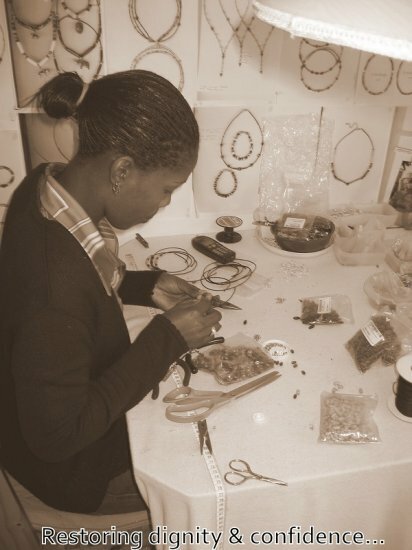 Her vision for beauty runs deep within her passion; not only to create beautiful jewelry that will benefit the the recipient but, also honor the lives of those that produce the pieces. This is truly beautiful on a multi-dimensional level. I personally and professionally admire Chanel! Chanel and her team design the most beautiful Jewelry at amazing and affordable prices. Her work is upmarket and unique and her pieces are a true work of art. I can highly recommend supporting her company, Sapphire Dawn as their Jewelry is fabulous!